Summary, etc. : Never again let the question, "What's for dinner?" stump you. 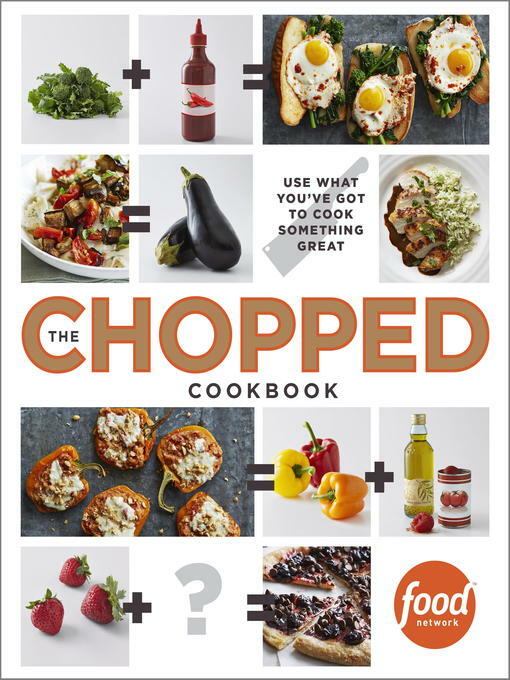 The Chopped Cookbookfeatures secrets for combining pantry staples to make exciting meals. If you've ever looked into your fridge, hoping for inspiration to strike, let The Chopped Cookbook help you shake up weeknight dinners. Just as each basket on Chopped has many tasty possibilities, so, too, do the contents of your refrigerator. By showing you how to spin your favorite ingredients into 188 fun, doable, and delicious recipes--including go-to guides for making salad dressings and pan sauces, four-ingredient market baskets that can go in many tasty directions, and ideas for ways to reinvent pasta dinners--the culinary masterminds at Food Network set you up for mealtime victory every night. Electronic reproduction. New York : Clarkson Potter, 2014. Requires Adobe Digital Editions (file size: 25936 KB) or Amazon Kindle (file size: N/A KB) or OverDrive Read (file size: N/A KB).